A sneak peek of rare photos of Ford cars! As part of their UK centerary celebrations, Ford are allowing us an exclusive peek into their Ford photo archives. From these photos of Ford cars, each specially selected photo shows another aspect of Ford’s continuing development and highlights historic moments for the brand. Photos of Ford cars: The much-loved Ford Transit, built and designed entirely in Britain, hit the 5 million mark in August 2005. 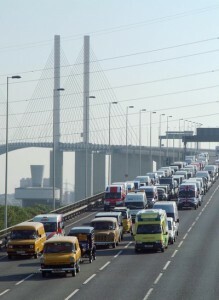 To celebrate, the Transit Van Club collaborated with Ford engineers and executives to put on a traffic-stopping rally across the Queen Elizabeth II Bridge in Essex. Over 60 classic Ford Transits crossed the bridge, including ambulances, the Ford World Rally Transit and Transits proudly decorated with the Union Jack.